" Your North Idaho Realtor® for Life, everyday - Mark my Words! " 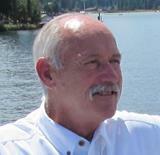 Mark helped me and my family find the perfect ski condo at Schweitzer. We had very specific needs and a budget that allowed for a limited number of condos. Mark worked with us until we found the perfect place. He worked well with the other professionals involved in the purchase and made sure that everyone completed what was needed in a timely fashion. GREAT experience. All the Super One Foods/ Groceries chain proudly fly the American Flag in North Idaho. It is nice to see it waving as you drive bye or walk in. I was treated to a rare sight, yesterday evening, as I walked from the store. Thunder storms had rolled through the valley, between the Selkirk and Cabinet Mountains, of the North Idaho Panhandle. With the sun having mostly disappeared behind the Selkirk Mountains this was the view, as I looked to the east from Sandpoint, Idaho towards Hope, Idaho and the Cabinet Mountains. Special moments will come at the most unusual times. I normally carry a camera or phone at all times, just for these types of moments. Not yesterday though. I litterally ran to the car to place the groceries and return, with my camera, to position for this shot.